I read this article and found it very interesting, thought it might be something for you. The article is called Auckland Transport is achieving high engagement rates. Here’s why… and is located at https://www.bangthetable.com/blog/ehq-staff-pick-auckland-transport/. The Auckland Transport team has impressed us with very high engagement rates in their past projects, making this a perfect site to showcase some effective ways to design your EngagementHQ site. Read on to discover what tools are used for this project and how they helped the Transport team achieve their project goals. We are sometimes hesitant to suggest using more than 2 or 3 tools per project. Why? If there are too many places for participants to leave feedback, a consultation can become diluted and essential messages lost. This is particularly true with small target audiences or when low participation is expected. In this project, 4 tools are enabled, which works well. Each tool asks for a different type of feedback and this is clearly outlined in the project description. Judging from Auckland Transport’s past projects, they have a very large target audience, hence there is a good chance each tool will receive a decent amount of engagement. This project contains a very short and snappy project description along with clear instructions on how and where to engage. Though we wouldn’t mind seeing hyperlinks to each tool and a ‘consultation ending’ date included. The team makes use of what must be one of the most underused features of EHQ. The site has a background image, in this case, a full page colour. 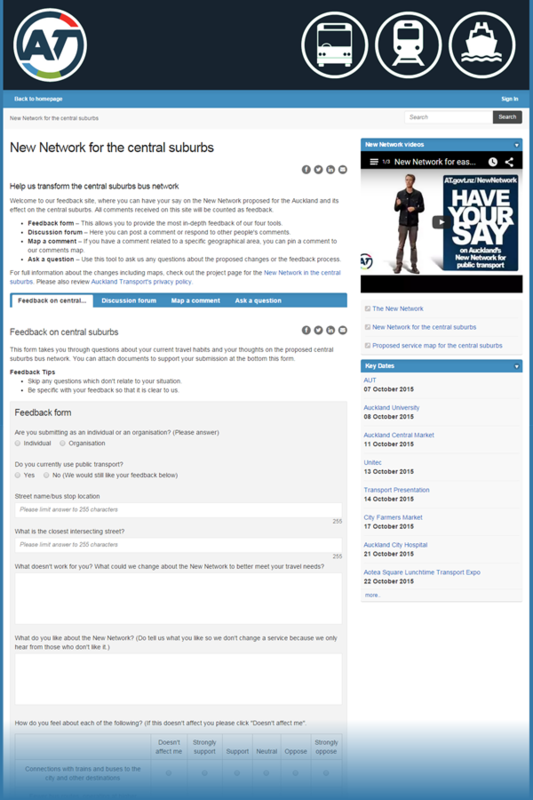 Although we like to see documents uploaded into EHQ’s own library, it is worthwhile checking out this consultation’s interactive PDF – ‘Proposed service map for the central suburbs’. Interactive PDFs are still somewhat scarce to find, but are fun to play with and can be an excellent tool for engagement. The Q&A tool is a great way to make yourself, as the project team, accessible and transparent. It also builds trust between you and your audience when responding in a timely manner. In the Q&A introduction, the team from Auckland Transport outline how long it may take them to respond to messages, which is great practice as it manages participant expectations. This consultation was launched alongside a dedicated project page on Auckland Transport’s corporate website and it’s best understood looking at both together. However, this can be slightly confusing. The EHQ page could have benefited from a little more detail, which is available on the corresponding corporate website. The Auckland Transport team state when and where they will be on the ground to meet the community but not the context. A simple one liner in the project description, which included a link to related dates could have introduced this better, or changing the widget title to be more reflective of the issues at hand. Auckland Transport had a project earlier this year with an unprecedented engaged rate of over 50%, that means more than half of all visitors to the project participated in the consultation, e.g. by submitting a response to a survey. This might be hard to replicate, but with this project set up, the team has given it a red hot go. In general, transport-related projects, alongside topics such as ‘dog on beaches’ and ‘parking issues’, tend to be very well visited and receive a high level of engagement. NOTE: The above is based on a visit to the site on 02 October 2015. Changes made to the project after that date may have altered the appearance of the project.